During our second adventure in Boston, we visited the JFK Presidential Library and Museum. We had an hiliarious and delicious dinner at P.F. 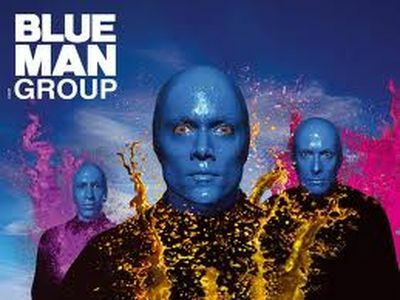 Chang's China Bistro and spent an evening at the theatre experiencing the controlled lunacy of the Blue Man Group. Do join Back Chat on a wonderful day in Boston. 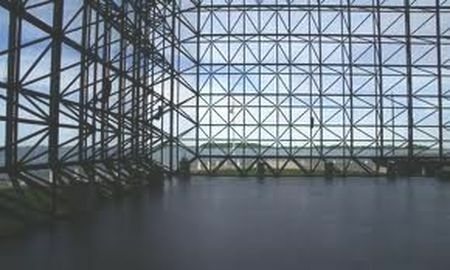 On a rainy day in June we visited the JFK Presidential Library and Museum. The sight of that splendid concrete building with its majestic glass pavilion was triumphal. 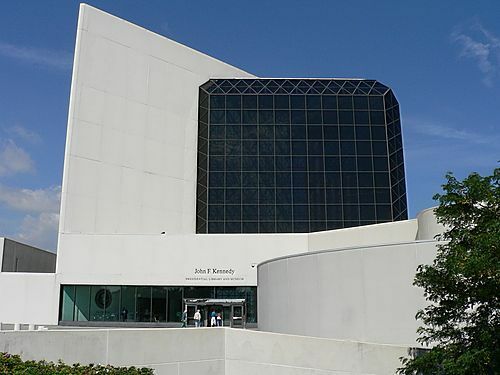 The great Chinese American architect, I.M.Pei, who designed the library, was the personal choice of Jackie Kennedy's. She picked him from a bevy of major talents because in her view he had the imagination and promise to realise her vision for the project. I love his startling glass pyramid above the Louvre in Paris and was overjoyed at the prospect of seeing more of his work. The tour started with an introductory 17 minute film with John Kennedy's own voice recounting his life until his nomination for the presidency. We wandered on through an exhibit of an appliance and variety store set in Main Street, U.S.A., in 1960. We enjoyed a 'back to the future' experience viewing the household artefacts of that era. I felt as though I was back in my mother's kitchen and that time had stood still. Onwards through exhibits displaying all the paraphernalia of his election campaign, and most amazingly, excerpts of the Kennedy-Nixon debate, the first televised presidential debate ever. Later we witnessed his entire inaugural address in colour with his familiar phrases delivered as part of an unforgettable whole. In another exhibition theatre we watched footage of the Cuban Missile Crisis and further on we viewed televised broadcasts from a replica of the Kennedy Oval Office. 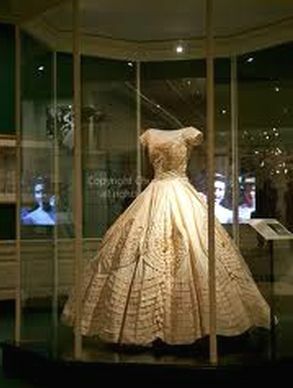 There were also exhibits devoted to Jacqueline Bouvier Kennedy's wonderful personal style and to her many accomplishments in the arts. When one eventually reaches the exhibit devoted to the assassination of JFK as announced by Walter Cronkite's on CBS news, one feels the shock. At the end of the tour we exited the museum and found ourselves in the enormous glass pavilion overlooking Boston Harbour. What a moment! The huge, geometric structure of glass and steel dwarfed us all. It has a vast cathedral-like aura and I felt that we ought to whisper. The 'Profile in Courage' award recipients receive their awards in this lovely place. It is the perfect setting. That evening we went to P.F. 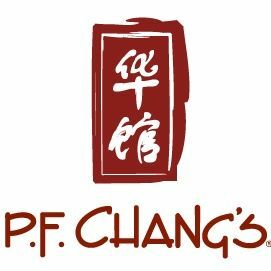 Chang's China Bistro for dinner. This was like nothing Eugene and I had ever experienced. A huge place with bustling waiters and demanding diners, where we were told that 'Family Style' meals were served. Translated, this means that all the portions are huge so that they can be shared. You'd think that I would learn!! With infinite patience, Robin and James guided us through the menu. I was fascinated. I wanted everything. To facilitate the process and to quench their thirsts, the men each ordered a pint of Singtao beer. This is served in a huge glass and tastes wonderful. Whilst in the U.S I had developed a passion for New Zealand Sauvignon Blancs and Robin ordered a glass of Brancott, Marlborough sauvignon blanc for me. Absolutely divine. Time was passing and I had to decide. Eventually I chose 'Chang's Chicken Lettuce Wraps as a starter and then Mu Shu Chicken as a main course. Eugene ordered Orange Peel Chicken and Robin and James ordered their favourite dishes. Now it was just a matter of eating what I had ordered. Oh dear me! 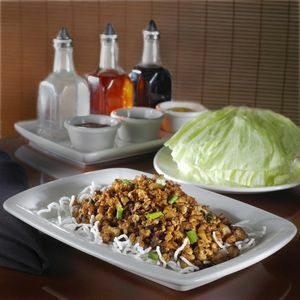 The menu descripton of Chang's Chicken Lettuce Wraps is: wok-seared minced chicken, mushrooms, green onions and water chestnuts served over crispy rice sticks and served with cool, crisp lettuce cups. Surely that wouldn't be too difficult. After all, I had eaten wraps before. Mu Shu Chicken is described as: chicken breast and julienne vegetables served with hoisin sauce and warm Chinese pancakes. Wrapped tableside. Another wrap, no problem! Incidentally, I had ordered more food than anyone else in spite of the dire warnings. The Chicken Lettuce Wraps arrived. All the bits were separate, so I supposed that I had to wrap every thing in the lettuce. Hah! Have you ever wrapped a whole lot of stuff into a lettuce leaf without anything to anchor it and then somehow managing to reach your mouth without dropping all the filling? Not possible. Eventually Robin showed me the trick. It all had to do with a flick of the wrist and somehow folding the lettuce and then flicking one's wrist the other way. As far as I was concerned it was as complicated as any Chinese puzzle I had ever encountered. So Robin had to do all the wrapping and arranging for me. That resulted in 4 huge concoctions. But it was worth all the fuss. They were amazing. Delicious, crunchy and crisp with a blending of tastes and textures that made the eating experience an adventure. But I could not even contemplate eating all of them. My dinner companions gallantly came to my rescue. My next course, the Mu Shu Chicken, looked marvellous on the plate, but this time I sought help immediately. One had to take the huge rice flour pancake, spread the hoisin sauce and then add a mixture of all the ingredients, fold it, pick it up and eat it. This made 3 or 4 massive stuffed pancakes. They were a triumph. The sweet, spicy taste of the hoisin enhanced the other flavours, never overpowering them. The completed whole proved to be as important as the sum of its parts and was succulent and luscious; another triumph! I loved them, but of course could not finish and the gentlemen once again stepped into the breach. Eugene loved his main course of Orange Peel Chicken. Slices of stir-fried chicken tossed with a mild chilli sauce and fresh orange peel created a wonderful balance of flavours. The sweetness from the orange peel combined beautifully with a little heat from the chilli. We had all eaten our fill, me the most I fear. Time to leave and onto the next part of the evening. We were going to the theatre. This was no ordinary theatre; this was the Blue Man Group at the Charles Playhouse at 74 Warrenton Street. The Blue Man Group is an organisation which produces award winning shows and concerts all over America, Europe and the East. It is described in the programme as 'a giddily subversive off-Broadway hit that serves up outrageous and inventive theatre where three muted blue-painted performers spoof both contemporary art and modern technology'. Weird, wacky and wonderful! We sat in the darkened theatre with streamers of loo-paper above our heads reaching towards the stage. Balloons and pipes were everywhere. Through all of this we watched in total fascination as 3 mute men wearing blue make-up and bald caps entertained us. There were acrobatic tricks, much beating of drums, lots of percussion and rock music. There were satires with modern communication tools such as great big Apple-like I-phones that appeared and disappeared and so the madness continued. Audience participation was an ingredient and still the Blue Men never uttered a word. Crazily, people in the front of the auditorium had to sit in raincoats and rainhats as from time to time water poured down on them. We had had a long and wonderful day. Time to go home and recharge our batteries. The next visit to Boston would take us to the fascinating Isabella Stewart Gardner Museum and lunch at Joe's American Bar and Grill and the best hamburger I had ever eaten. 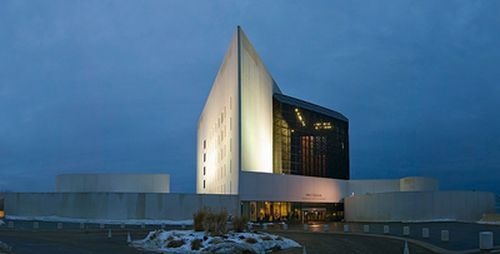 P.S: A fascinating postscript about the JFK Library and Museum, is that the Ernest Hemingway Collection, which includes more than a 1000 manuscript items; more than 10,000 photographs; family scrapbooks; several thousand letters written by or to Hemingway and books from his private library, many with his handwritten notes in the margins, is housed in the JFK Library Archives. What unimaginable riches! 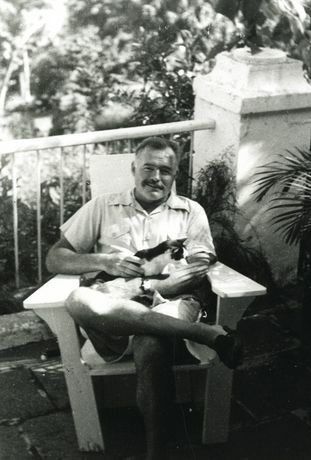 Kennedy and Hemingway never met, but when Hemingway died in 1961, Kennedy released a statement saying "Few Americans have had a greater impact on the emotions and attitudes of the American people than Ernest Hemingway......"
Kennedy assisted Hemingway's widow, Mary, in claiming this vast literary and personal estate from Cuba and in 1964 Mary Hemingway offered her husband's collection to the JFK Library and Museum. I felt that it was so appropriate that the records of the life and times of my great hero, Ernest Miller Hemingway, should be housed in this wonderful place of dreams. Thank you Leslie for such an enthralling read!! For those of us that have not yet been able to enjoy the experience of Boston, you certainly have planted a seed of determination to get there! Wonderful. I am delighted that you enjoyed our Boston adventure. I do hope that you do get to explore it for yourself one day.